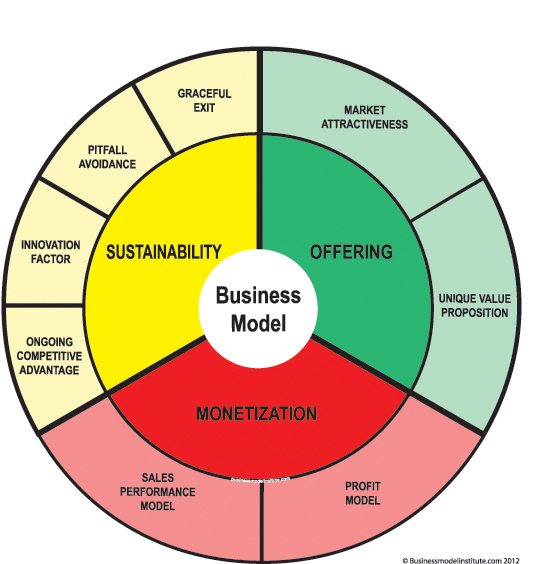 Designing or updating your business model becomes easier when you think through your offering, monetization, and sustainability. As you work on your business model, keep important tips in mind, ask questions to stay on track, and browse different pricing models to determine what’s best for your business. Market attractiveness: The industry, niche, and customer segment you will sell to. Unique value proposition: The significance of the opportunity to stand out in the marketplace and how strongly your offering does so. Profit model: The streams of income created by the offering and the associated margin generated. Sales performance model: Converting the marketing expectations into actual paying customers. Ongoing competitive advantage: Creating meaningful differentiation and advantage today and tomorrow. Innovation factor: Balancing the need to innovate to keep up with competition with your ability to do so. Pitfall avoidance: Making sure a good model doesn’t succumb to regulation, litigation, fads, or excess reliance. Graceful exit: Creating a model that allows the owner to sell the business for a large sum of money or run it as a CEO Emeritus. Different is always better than better. The better mousetrap plan rarely works. No margin, no mission. Great business models have great margins. If it’s not easy to sell, it’s not worth doing. Only the market decides which ideas are good. Most great ideas aren’t appreciated by the mainstream until they work. Don’t worry about what everyone thinks about your ideas. Think about your exit strategy as you’re building your business model. There’s no point building a job. Does the model generate margins superior to the competition? How easily can your idea be copied? What can you do to slow down the competition? What happens if a larger competitor copies your idea? Are you aiming for non-consumers or to have existing customers of a competitor switch to your brand? A is easier than B. How will you get the product into consumer’s hands, and how easy will it be to get consumers to pay for it? Think about Twitter and other great products that couldn’t monetize the offering. How will changes in buying habits, trends, interest rates, increasing competition, and the general economy affect your model? Great business models command better margins than the competition. Sometimes, a business model can be improved simply by clever pricing strategies. The list below offers some methods to potentially raise prices and corresponding margins. Premium pricing: You can’t help but think that expensive products are better. Tiffany’s, Starbucks, Rolls-Royce, and high-end New York restaurants have used premium pricing to create a perception of luxury to generate high margins. Penetration pricing: Using artificially low pricing to gain distribution makes sense if you’re trying to establish a beachhead or build economies of scale. Economy pricing: This model uses the perception of thrift. However, just because the product is priced lower than other offerings doesn’t mean that margins must be lower. Generic brands earn more for grocery stores than name brands earn. In other instances, economy pricing is necessary to drive the initial sale and thereby secure add-on sales. Low gasoline pricing is needed to secure cigarette and soda sales for instance. Price skimming: Charging a high price when an item is new or has little competition. As demand and competition increase, prices are lowered. For instance, when DVD players were new to market, they cost around $800. As demand increased, pricing decreased in kind. Psychological pricing: Human beings can’t help but feel that $499 is cheaper than $500. Walmart uses sevens instead of nines because consumers have become savvier. Product line pricing: For decades, General Motors used the same body style and components to brand the same vehicle under more profitable lines. The Chevy Cavalier, Buick Skyhawk, Pontiac Sunbird, Olds Firenza, and Cadillac Cimarron were virtually the same automobile with differing emblems on the hood. Optional product-pricing: The base-model or initial purchase is sold at lower margin but related items are sold at much higher margins. Mobile phones have low margins but adaptors and cases have very high margins. A plain cup of Starbucks coffee isn’t particularly expensive, but start adding milk, spices, and some froth and it doubles in price. Captive product pricing: Movie theaters, amusement parks, resorts, and airlines have customers trapped and can charge much higher pricing as a result. Product-bundle pricing: Microsoft increased overall margins by bundling all its Office software. Southwest is attempting to bundle all the costs of airline travel while other airlines nickel and dime customers. Another example is highly profitable service agreements bundled with copiers and other equipment.